In My Sentimental Library Collection, I have several shelves full of books that were formerly owned by some really, really famous people. This book is not one of them. Unlike one of its early owners, I am not interested in the subject matter of this book. I bought it specifically because of its dubious but collectible record of ownership: Relics of Charles Lamb. I, for one, do not believe this book was ever a part of Charles Lamb's library. 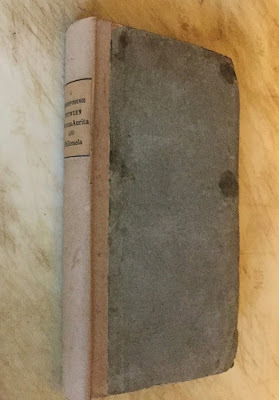 However, down thru the years, there were and still are bookmen who believe that books containing the printed label, Relics of Charles Lamb, actually came from Lamb's Library. And that has made these books collectible. Today, I will tell you about the dispersal of Charles Lamb's library, how I first heard about the Relics of Charles Lamb, what I now know about it, and finally, I will tell you just a little bit about the provenance history of this book, A Correspondence Between Noctua Aurita and Philomela. When Charles Lamb died in 1834, his estate was placed in trust for his sister Mary. But his books were bequeathed to his friend and publisher, Edward Moxon; however, they remained with Mary until her death thirteen years later. During that interval, an unknown number of Lamb's books went out the door under the arms of the friends of Charles and Mary Lamb. After Mary Lamb's death, Moxon selected sixty volumes of Lamb's best books and sent them to America with his friend Charles Welford for sale. Moxon "reportedly" destroyed the remainder of the books in Lamb's library. Charles and Mary Lamb had cut engravings out of their books and pasted them on the walls, rendering the condition of many of the books deplorable. I say "reportedly" because in their books, W. Carew Hazlitt and R. L. Hine dispute the fact that Moxon destroyed the remainder of books in Lamb's library. Charles Welford, then of the firm of Bartlett & Welford, put Lamb's books on exhibition in his bookstore, located in the Astor House, the first luxury hotel in New York City. The books were quickly sold after The Literary World published a list of Lamb's books for sale in its Feb. 5, 1848 issue under the title, "A Descriptive Catalogue of the Library of Charles Lamb." In 1897, the Dibdin Club published 100 copies of the catalogue for its members. I have Vincent Starrett's copy. 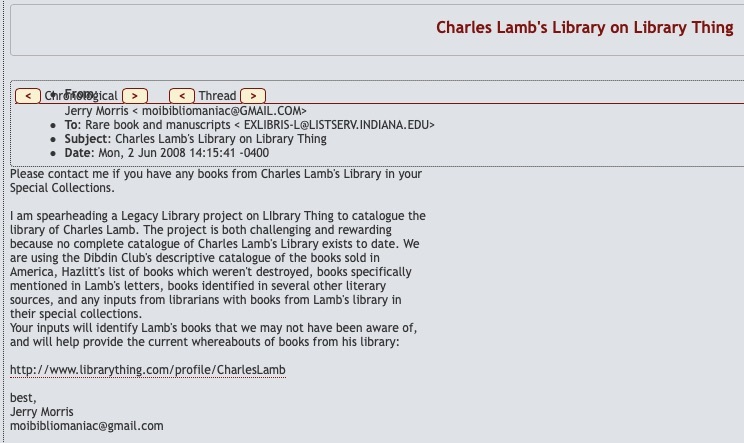 On May 20, 2008, armed with Starrett's copy of the catalogue, I decided to catalogue Charles Lamb's library on Library Thing, a social cataloguing website where members can catalogue their own libraries as well as the libraries of famous people. Another LT member, Dave Larkin, had invited me to help him catalogue Samuel Johnson's library on Library Thing in January 2008. And when we got done with Johnson, I invited him to help me catalogue Lamb's library. 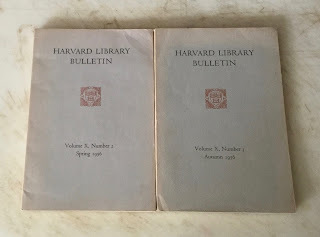 In addition to the Descriptive Catalogue, I also had a set of The Letters of Charles Lamb that the Bibliophile Society in Boston published in 1905. Lamb received numerous books from his friends and fellow authors and thanked them in his letters. I had already enjoyed reading Lamb's letters, but I would re-read them this time with an added purpose in mind. Researching further, I discovered that both W. Carew Hazlitt and E. V. Lucas included in their books about Charles Lamb, additional lists of books they believed were in Lamb's library. Moreover, their books were available for researching on Google Books. Even better, the Lamb catalogue the Dibdin Club published was on Google Books as well. And Dave worked from that while I pored over Lamb's letters. The response from the librarians was overwhelming! 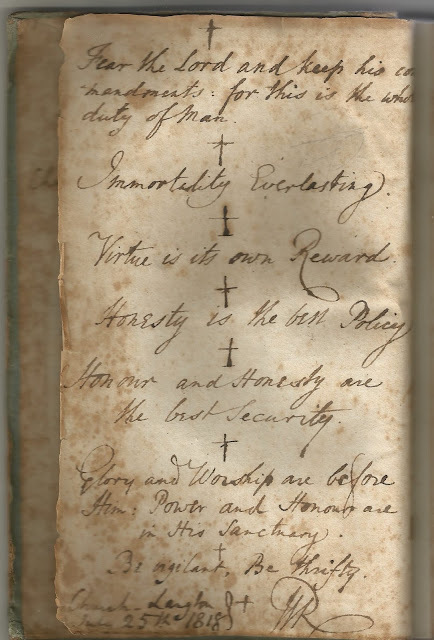 In addition to books containing inscriptions and marginalia in Lamb's hand, there were books from some rather prestigious libraries whose only record of ownership by Lamb was the printed label, Relics of Charles Lamb: Cambridge University Library; Lewis Walpole Library, Yale University (two books); John Hay Library, Brown University; Spencer Research Library, University of Kansas; Pennsylvania State University Library; Dunedin Public Library (in New Zealand); and several more! My cataloguing partner, Dave Larkin, then found several Lamb books at the Houghton Library at Harvard, including Johnson's Prayers and Meditations in the Donald and Mary Hyde Collection of Samuel Johnson (and I'm the Mary Hyde Collector)! 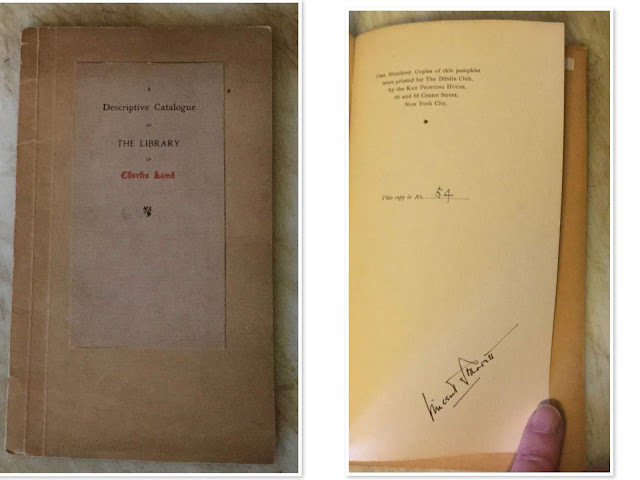 The renowned antiquarian bookseller, the late Norman Kane, responded that he remembered selling a 1697 copy of the tragedy Theodosius by Nathaniel Lee that had the Relics of Charles Lamb label. He sold it for $165. The book was lacking one leaf that Kane reproduced in facsimile. The book contained a manuscript note by a Richard Charles Jackson: "...This must have pleased the immortal St. Charles immensely." Kane then mentioned that according to Claude A. Prance's book, Companion to Charles Lamb, Richard Charles Jackson claimed to be the grandson of Lamb's Capt. Francis Jackson. I soon acquired a copy of Prance's book, and gathered a wealth of informatin about Richard Charles Jackson (1851-1923) and his grandfather, Francis Jackson. The grandson was an eccentric bachelor who claimed to possess relics of Charles Lamb, Samuel Johnson, David Garrick, and William Blake. The sale of his estate in 1923 contained five pieces of furniture allegedly belonging to Lamb and 116 volumes of "the Lamb Collection of Books." Prance revealed that there was a Francis Jackson who was at Christ's Hospital a year after Lamb left. Prance then refers to R. L. Hine's 1949 book, Charles Lamb & His Hertfordshire, where "it is stated that a Francis Jackson of the Red House, Mare Street, Hackney, bought Lamb's relics at the Moxon Sale in 1858 and some of them came into Hine's possession." Yes. I acquired Hine's book as well. According to Hine, Moxon sent upwards of sixty volumes of Lamb's books to America for sale and "with the exception of a few retained for his own use, including 'these relics,' he destroyed the remainder." Hine relates how Francis Jackson bought Lamb's books at the Moxon sale presumably shortly after Moxon's death in 1858. Surprisingly, there appears to be no mention in the book by Hine of the grandson, Richard Charles Jackson. The Victoria & Albert Museum was kind enough to send me the catalogue page containing the "Lamb" Collection of Books from the Goddard & Smith Auction on July 23-25, 1923 of the estate of Richard Charles Jackson. 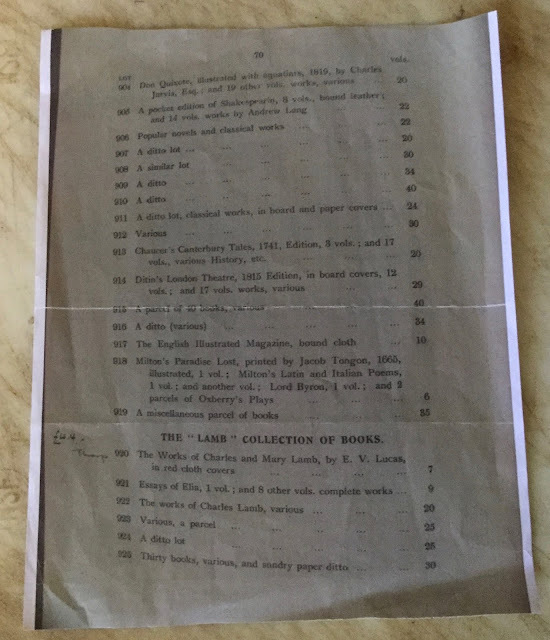 The London bookseller, Thomas Thorp, bought the entire Lamb Collection of Books, lots 920 thru 925 for £4.4 The last three lots, 80 books in all, most likely were the books containing the printed label, Relics of Charles Lamb. In 1939, Columbia University Press published a biography of Edward Moxon by Harold G. Merriam. I acquired the book and read it hoping to find out if and when a Moxon Sale of Lamb's books ever occurred. Merriam makes no mention of a Moxon Sale. Moreover, I've searched bookseller listings and queried booksellers. And no such auction catalogue of a Moxon sale has appeared to date. One of the first bookmen to doubt the existance of Lamb's books bought at a Moxon Sale was Edmund Blunden (1896-1974). I cite Luther A. Brewer in his 1932 book, My Leigh Hunt Library. 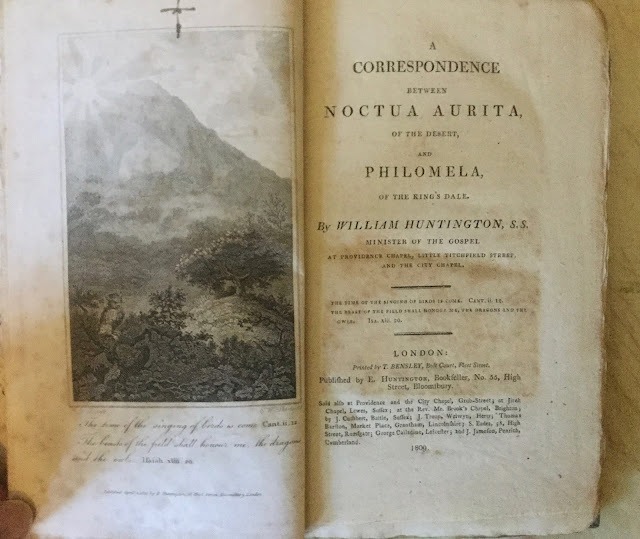 Brewer describes the bibliographical data of his copy of Flora Domestica, notes the attached Relics of Charles Lamb ticket of Lamb's books bought at the Moxon Sale, and adds "Mr. Blunden doubts this, saying that Jackson was accustomed to make all sorts of claims that were false." Another bookman who doubted the existance of Lamb's books bought at a Moxon Sale was Carl R. Woodring (1919-2009). He wrote an extensive seventy-two page report, "Charles Lamb in the Harvard Library," that was published in the Spring and Autumn 1956 issues of the Harvard Library Bulletin. Woodring meticulously inspected the books containing the Relics of Charles Lamb label Harvard had obtained after the 1923 estate sale for any evidence that they belonged to Charles Lamb. I love his summation: "Unless it can be assumed that nobody but Lamb ever stained a book with coffee and tobacco, they bear no marks from Lamb's hands." Woodring, however, added a big "If." He continued, "If any of the volumes with the Francis Jackson bookplate are found definitely to contain notes in Lamb's hand, the case for all of them will of course be greatly strengthened; otherwise, in the absence of further information, it must be doubted whether Lamb owned any of them." I mentioned the Relics of Charles Lamb bookplate and Woodring's article on Charles Lamb's Profile Page on Library Thing. John Windle, the antiquarian bookseller from San Francisco, listed a nonce collection of plays "supposedly once owned by Charles Lamb" in item 1144 of his 2009 Catalogue, William Blake: A Catalogue of Books by and About Blake and his Circle from 1775-2008. In the listing, Windle mentions Jackson's bookplate and that the examination of the books Harvard obtained after the sale of Jackson's grandson's estate "gives no reason to believe that any of the books with this label had ever belonged to Charles Lamb." Bonhams in London held an auction of Law Books belonging to LA Law Library on Mar 5, 2014. Lot 432 contained several books about trials, including a third editon of The Genuine Trial of Marie Antoinette, which contained the printed label, Relics of Charles Lamb. Bonhams made no claim of Lamb ownership of the book in the listing. On Lamb's death, his books were inherited by the publisher Edward Moxon, who left them in situ with Lamb's sister, Mary (who Charles had lived with and cared for ever since she stabbed their mother to death in a bout of insanity). When Mary herself died in 1847, Moxon sent sixty of the best books to America for sale, reportedly destroying the rest. However, sometime after Moxon's death, a number of Lamb's books were apparantly purchased at 'Edward Moxon's sale' by one Francis Jackson, 'Citizen, Merchant and Ship Owner of London,' who inserted bookplates describing them as 'Relics of Charles Lamb.' Some 116 such books later passed to his eccentric grandson Richard Charles Jackson. At least one we have traced, Owen's Book of Fairs (1778) (Christie's, The Halsted B. Vander Poel Collection of English Literature, 3 March 2004, lot 107) seems to contain annotations in Lamb's hand. Christie's indeed advertised Owen's Book of Fairs, lot 107 of the auction, as having annotations in Lamb's hand. And it too contained Richard Jackson's Relics of Charles Lamb bookplate. The words Lamb reportedly wrote to correct an entry were "April 20 for Horses and Cheese." The Christie's cataloguer concluded the listing with this sentence: "Although upwards of 60 books from Lamb's library were purchased en bloc by Bartlett and Welford of New York early in 1848, the 'Relics of Charles Lamb' bookplate in this volume demonstrates that Moxon held a sale of books, which were not simply 'destroyed' as Lucas states (the Life of Charles Lamb, II, p.304)." I do wonder if there was a question about the authenticity of Lamb's annotations after the auction was over. Although the Invaluable website lists lot 107 of this Christie's auction as "sold," lot 107 is not listed as "sold" on the Results List of Past Auctions on the Christie's website. The reason I ask myself this is because "Lamb's copy" of Owen's Book of Fairs appears at auction in Boston thirty-two months later, on November 19, 2006. "Lamb's copy" of Owen's Book of Fairs appears as part of lot 272, along with two copies belonging to Robert Southey, in Skinner Auction No. 2341 Books and Manuscripts. The provenance of Owen's Book of Fairs is listed simply as "Lamb, Charles (1775-1834), his copy." There is no mention of annotations in Lamb's hand. The estimate for this lot was $600-800. The lot sold for $499. There is, however, more provenance history to research concerning the former owners of this book. Agnes Arber, the Britsh botanist, bought the book from Serle and gave it to her geologist daughter, Muriel Agnes Arber for Christmas in 1931. At first I thought that Agnes Arber gave her daughter the book because Muriel was a fan of Charles Lamb. But that might not have been the case. Agnes Arber's maiden name was Robertson. And she had a grandfather who was a botanist. Moreover, there was a botanist named W. Robertson in England in the early 1800s. Is it possible that Muriel Roberston Arber somehow learned that this book once belonged to her grandfather and wanted her daughter to have it? The idea is a stretch. But I'll believe that before I will believe that books containing the printed label, Relics of Charles Lamb, were from Charles Lamb's library! Thank you for this exhaustive research Jerry. Now I have a better understanding and will know what I'm looking at. I remember having some Charles Lamb in my library so I will go back and look to see exactly what is there. It's like being a book detective. Love it! Irene Pavese fellow FBS member.